Stan Gurski and Steve Serna. 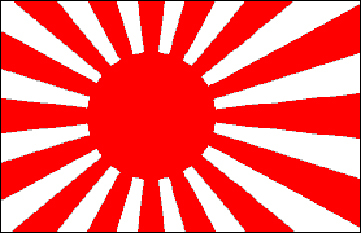 Tenno Heika Banzai meaning Long Live the Emperor, shortened to Banzai, was the battle cry of fanatical Japanese troops as they charged American marines and soldiers in suicidal human wave attacks. Banzai charges were often conducted by remnants of Japanese troops following defeats in organized battle, as a last resort and alternative to surrender, leading to some of the most savage fighting in the Pacific/ Asia theater during WWII. 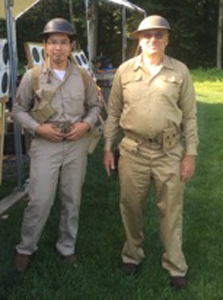 Tenno Heika Banzai was also the title of one of the battle themed contests in the recent 14th annual VJ Day Military Match conducted by the New Jersey Arms Collectors Club (NJACC). Military aficionados and serious arms collectors from all parts of New Jersey, Pennsylvania, and New York made the trek to the Shongum Sportsman's Association range at Oxford, New Jersey on August 15, 2015 for a day of friendly competition and a hearty lunch prepared by the club's own culinarian and stand in cook, Tom P. There was lots of food and plenty of it, so if anyone left hungry it was their own fault. Happily no casualties were reported to have resulted from lunch again this year. Once again participants brought examples of American, British, Russian, and Japanese rifles used in those long ago battles and competed for trophies and the ultimate glory of being mentioned in this dispatch. Contest rules required shooters fire 10 rounds in 2 minutes at targets placed at 100 yards. This year there were sixteen contests in the course of fire, three of which were combination rifle/handgun events and two handgun only events. A quick tour of the benches disclosed many competitors had brought a fine variety of U.S. M1 Garands, 1903 Springfields, and Model 1917 US Enfields. Several Thompson semi auto carbines were on hand as was an ultra nifty Model 1918A2 type BAR semi auto rifle. British and Australian weapons were also well represented by MKIII SMLEs, No.4 Enfields, No. 5 Jungle Carbines. Last but not least there were plentiful samples of Japanese Type 38 and Type 99 rifles and their many variants including a nice Type 100 paratroop rifle and a rare Type 30 "Hook Safety". In addition a few less common rifles from the Asia/ Pacific war were on the line and highly worthy of note. Among these were: a Chinese Hangyang type rifle and very nice Italian made Japanese Type I along with a number of 98K rifle similar to those used by China and several Mosin Nagant 91/30s used by Russia. After a brief sighting in period, the match got under way. Rifle competition progressed smoothly under the watchful eye and expert guidance of the NJACC club's shoot chairman Stan G. and range safety officer Steve S. Once again, combination rifle and pistol contests, which have become increasingly popular at these matches, drew a goodly number of competitors. The second event called Gung Ho was a multi-positional contest using an M-1 Garand and a 1911 pistol. Also added this year, was the afore mentioned Tenno Heika Banzai contest that required the shooter to fire a Japanese rifle off-hand with fixed bayonet at a target placed at 100 yards. Many top shooters vied for the trophies awarded for the highest score in each contest. One shooter, Chris C. participated as a Filipino Scout in an awesome and authentic WWII uniform. All shooting benches were taken as over 20 shooters competed, setting a high bar for accuracy with some very close scoring. The top score of the day (99-4X) was turned for the Manchurian Contest by a 70 year old shooter firing an 80 year old Turkish copy of the Chinese Hangyang type rifle, proving that some of those antiques can still shoot. The Tenno Heika Banzai trophy for best score with a Japanese rifle with fixed bayonet went to John M. using a Japanese Type 99 rifle with a score of 81, which was no mean feat considering the awkwardness of those weapons. John also won the grueling Gung Ho contest with a score of 273-3X and the Edson's Ridge event with a score of 95-2X. Glenn K. successfully cleared the Palm Trees with a score of 322, which was over 50 points higher than the next closet competitor, using a very nice Remington Model 10 shotgun and an original Colt 1911. The overall big winner of the day in the rifle contest category was Jay R. who took home four of the coveted trophies. He was followed by John M. and Paul M. with three wins each. After a satisfying gourmet lunch of authentic military style cuisine consisting of tube steak smothered in crusted chili on a bun with sauerkraut and baked beans, the pistol events commenced on the indoor range under the supervision of Steve S. Contestants brought a treasure trove of vintage collectable pistols used by Japanese and Allied troops. Glenn K. who also won the Palm Tree Clearing contest, dominated in the pistol events winning all of the contests with highly respectable scores using a Japanese Nambu model 94 and an original Colt 1911. As usual, the unsung task of registering competitors, scoring targets, and reporting results was handled by Tom P. in addition to his duties as demi-chef. Tom did have some help from a couple of shooters and Shongum Staff in scoring while he was trying to play catch-up. All scores were certified by a range official and are shown below. For Best Female Score Pam A. ANY 6.5 JAPANESETYPE 38 or TYPE I(Italian) Paul M.
ANY JAPANESE 6.5 OR 7.7MM Long RIFLE) Dave T.
ANY JAPANESE 6.5 OR 7.7MM SERVICE RIFLE or CARBINE Jay R.
#5 ENFIELD JUNGLE CARBINE .45-70 Jay R.
Six Rounds GI Handgun @ 25yds Glenn K.